This is so smart but I never would have thought of it on my own. Thanks so much for sharing! Yum, I love portobello mushrooms! Another tasty way to eat them is in a pita, like a burger... delish! Mmm... these are making me hungry. I love the combo of turkey bacon and pineapple... I need to try these. My kids love to do "make your own" pizzas... I'm thinking we could do "make your own portabella pizzas!" Thanks for the inspiration!! Awesome recipe! I never would have thought to do this with portabellos. There are so many possibilities for toppings. woohoo!! what a fantastic GF "pizza" recipe! I love mushrooms, and I bet this would taste SOO good. Thanks so much for the idea. 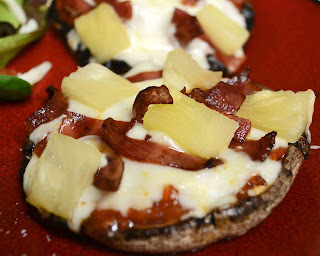 I've made lots of things using portobellos, but never even thought of pizza. You're a genius! Thanks for sharing! Pizzas on mushrooms - this is brilliant!! I love this idea and am pinning it to try myself sometime! Thanks for the inspiration! these are great! 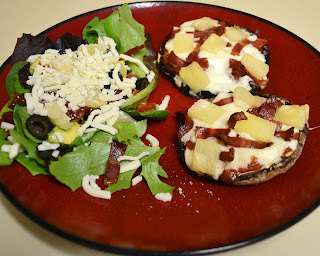 I absolutely love mushroom anything and have been a total "healthy pizza" junkie lately lol. I never would have thought to add the pineapple though.. I might have to give that a try! I saw this on pinterest and thought I needed to try it. This post reminds me that I want to do it...sooner rather than later. Much better than all the carbs in crust! And easy to make...yum! Interesting concept. I love port. mushrooms (any mushroom really). They also make really interesting "meatballs" for pasta as well.